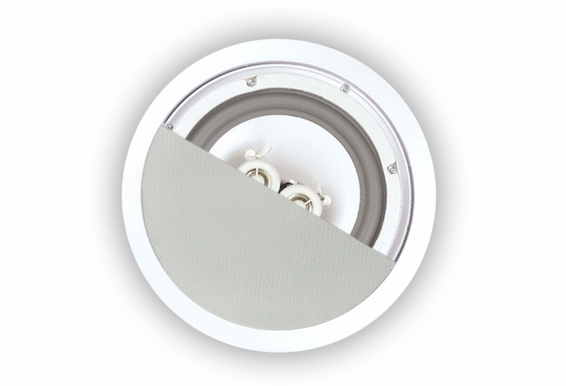 Enjoy music in high humidity areas like the bathrooms, laundry rooms or covered patios with this single, dual voice coil water-resistant 6½"in-ceiling. 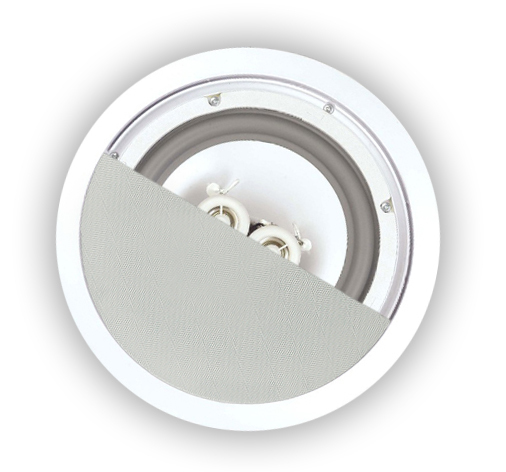 This single in-ceiling speaker has a high power handling of 150 Watts and is great for covered porches and patios! 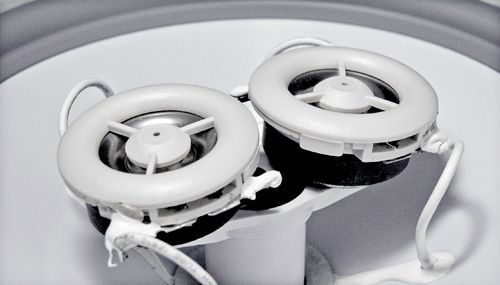 What Is a Dual Voice Coil Ceiling Speaker? 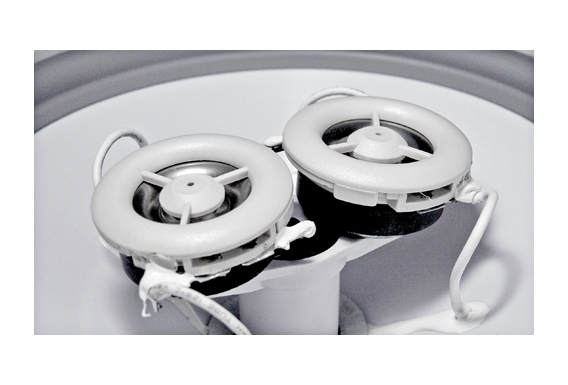 A Dual Voice Coil (DVC) Ceiling Speaker uses a special voice coil cone design that allows both channels of a stereo system to drive one cone. Sounds complicated but it's not. Basically, a DVC speaker plays both right and left channels through one speaker cone. 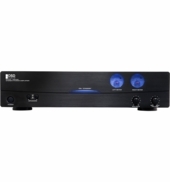 You get both channels but without the acoustic separation that happens with two speakers. 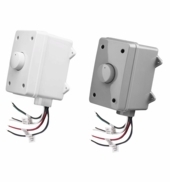 There are places like bathrooms, closets or hallways that just can’t accommodate multiple speakers so a DVC speaker solves the problem and produces great sound. 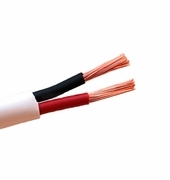 Should I Purchase special cable for in-ceiling speakers? For a retrofit installation, no construction bracket is needed. New Construction Bracket Use Model NCCB6 (not included). 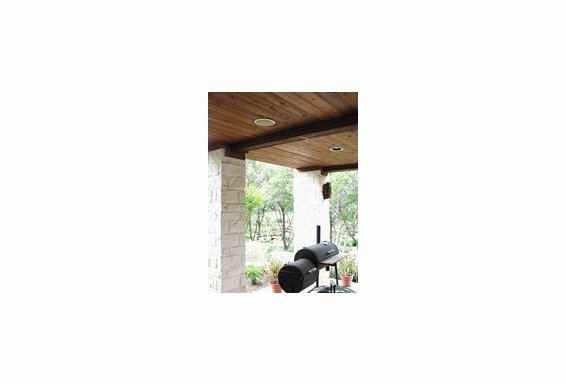 Diameter & Depth: 9" x 3 1/2"
Water Resistant design which can be used in high humidity areas such as Outdoor patios, bathrooms or laundry rooms. 150 Watts!!! Dual Voice Coil!!! 10yr Warranty! 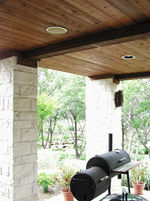 Great for covered porches & patios! I'm mounting these speakers in my cieling. Do I need a speaker enclosure to cover the back of the speaker to protect it from the attic environment? And if I do, can you recommend one? 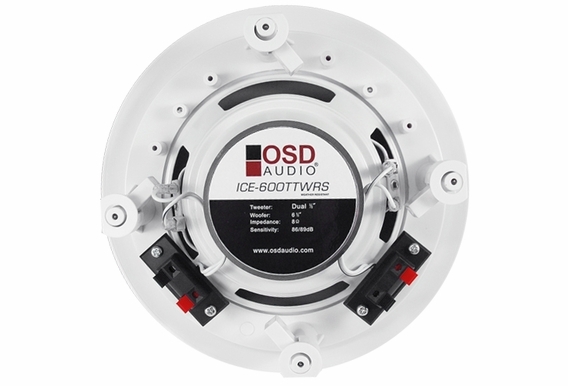 I purchased 6 of this speakers and I daisy chain them with two wires, left and right from the first one to the second then to third and like that to the 6th. It is unfortunately all on 2 cables. The ceiling is already closed. How powerful amplifier need to be to have a normal sound. Thanks. do you have CSA approve for your stereo in ceiling speakers? I located in BC Canada. Is there a square grille option? 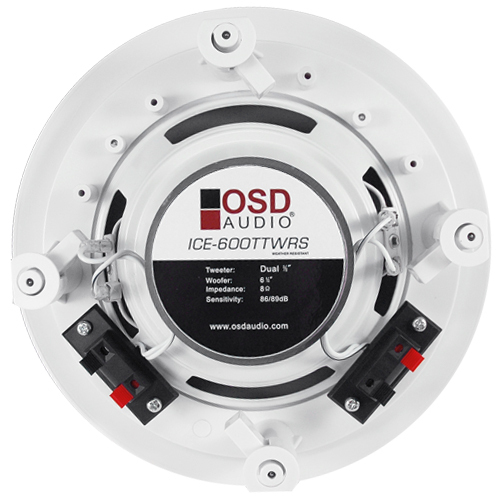 Do you have a wiring diagram? I'm trying to figure out how to run these from my outdoor patio. Can you mount this in a shower? I have a walk-in tiled shower with a glass door with about 8" of clearance above the glass that lets the moisture escape. Would this hold up? 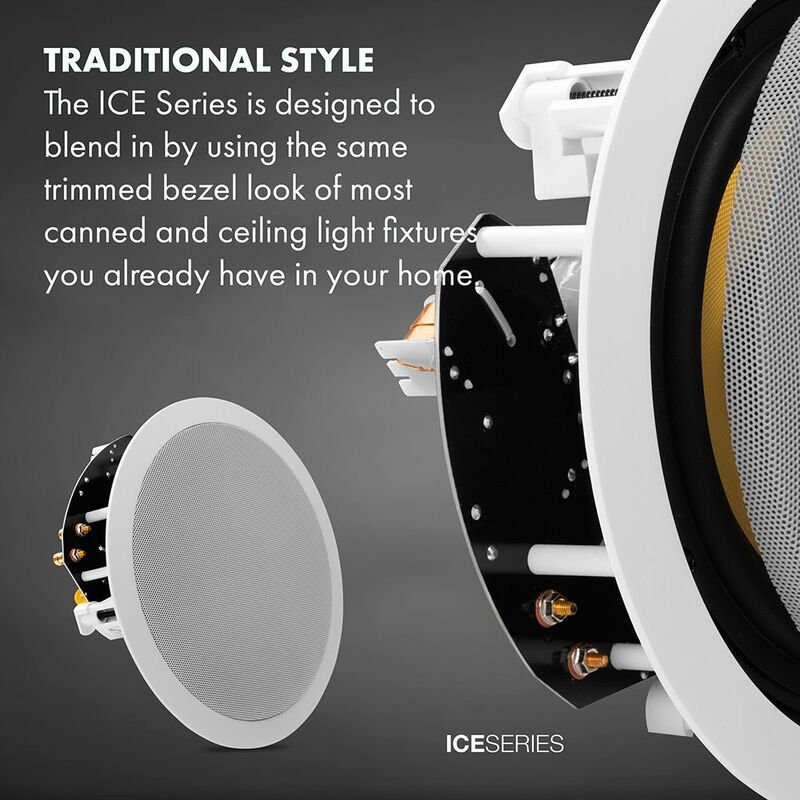 Would these speakers work in the marine environment? are they fully water proof ? Would these be suitable for a steam room or a sauna? 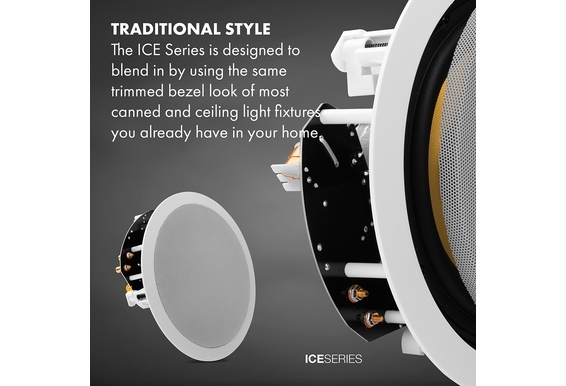 When Ceiling Speaker Weather Resistant ICE600TTWRS will be available? 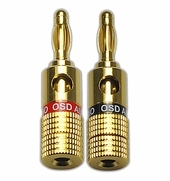 Hi Ricardo, We are hoping to receive these in-stock between October and November. Check back in then. Thanks. 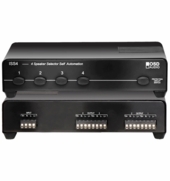 Can I run two of these speaker on the same amplifier if it only has one set of speaker inputs? I will be installing 3 pairs of speakers on an exposed lanai. 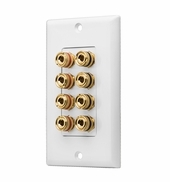 Do I have to run left and right channels to these speakers? I have Danon receiver and I have about 900 sq ft covered patio. the area is 15'x60' long? HOw many speakers do you recommend? What kind of speaker do you recommend? will mini 30watt amp power this speaker? How many watts does my amplifier need to be to power this speaker sufficiently? I was going to purchase this from your site A0240 80 Watt Stereo Amplifier or Pyle Home PVC8U with 75 watts. Why are there two sets of inputs? What is the distance between mounting holes? I am replacing existing Nutone speakers that have fallen apart., The Nutone holes are 7 3/4 inches apart on center. Is the speaker frame and grill painable? I wish to have a black frame and grill.